Wining and dining is the oldest old school way of closing deals. But just because it’s an old school method and startups are a new type of business doesn’t mean you won’t eventually find yourself trying to seal a deal over a swanky restaurant table. If your experience in restaurants so far has mainly included dates and late night fast food joints after a night on the town, you’re probably wondering how, exactly, you should conducted a business breakfast/lunch/dinner meeting. Don’t despair, startup founder, because Paradine and I have got you covered. 1. Pick a good restaurant. Paradine CEO and co-founder Jake Farmakis at TechCrunch Disrupt. The very first thing you need to do is make sure you’ve chosen the right restaurant, which is a task that’s harder than it sounds at first. While you could comb through Yelp reviews or ask every person you know, how can you know that you’re picking the right place? Fact: reviews from strangers are hardly reliable and your friends don’t necessarily know anything about your business or your client. 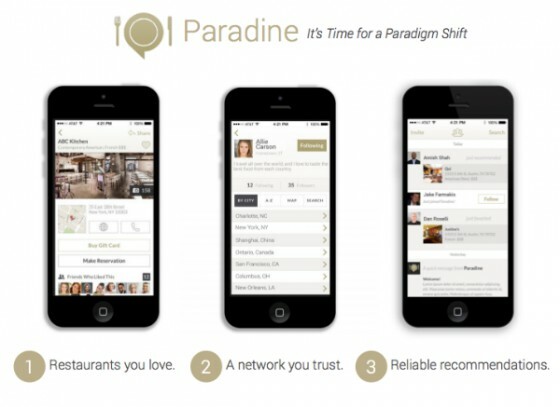 Rather than rely on these two methods a risk screwing it up, check out Paradine, which just won Top Business App at TechCrunch Disrupt. 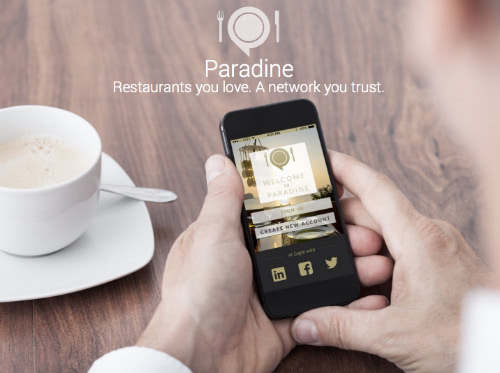 Because Paradine connects with both your personal and professional social networks, you get a range of recommendations that specifically suit your needs. Going on a lunch with an angel investor? Check out recommendations from other angels in your network. Using Paradine, you’ll be exponentially less likely to mess up this crucial first step, whether you’re in your own city or on a business trip. 2. Don’t leave the check up to chance. While dinner with your friends probably ends with everyone trying to work out the math on their phones, a business dinner is paid by the person who invited. In this case, that probably means you. Avoid the awkward faux pas of the waiter bringing your guest the bill at the end of the meal by informing the server ahead of time that you’ll be taking care of it. If you really want to avoid any check-related bad feelings, find your restaurant on Paradine and then show up early to give the host or server your credit card. Let them know that you want to include a 20% tip on the bill and they’ll bring it you already closed out at the end of the meal. Another way to become familiar with the best options the restaurant has to order is to see what your connections on Paradine recommend. You can also check out the recommendations of people you know who are in a similar field or age group to your guest if you’re really concerned about picking the right foods. Basically, Paradine can help you sound like an expert in fine dining even if the last three times you ate out it was at the pizza joint on the corner. 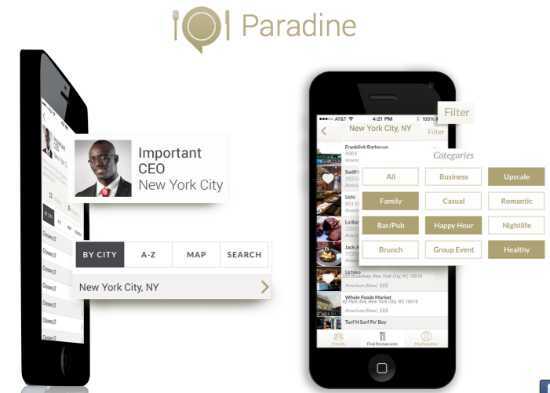 Regardless of what your guest is doing, your cellphone needs to stay out of sight for the entire meal – even though you arranged the whole thing on the Paradine app. Nothing is more important than the person in front of you, not even an emergency back at in the office. Especially if your guest is a potential investor, you need to make sure that your phone is off and ignored for the duration of the meal. 5. Don’t drown your nervousness in booze. One drink rule. Let me repeat that to make it super clear: One. Drink. Rule. If your guest is drinking more than one and insists that you join her, take tiny sips so it looks like you’re drinking even though your glass isn’t getting any lighter. No matter how nervous you are, don’t fall into the trap of thinking that alcohol will let you loosen up. You need to be in control of yourself throughout your meeting, not letting loose like your guest is your co-founder after a long week of fundraising. Practice basic table etiquette. You know, like your mama taught you.